Read articles about Tolcap in action. How often have you been in a meeting to be told about a "cost reduction" - and groaned? You know what I mean - often it's the Purchasing guy (and all he's doing is chasing the material cost saving targets he's been given) - but he's discussed your component with the supplier and they're both quite sure they don't have to do that operation that adds so much to the cost. Here is a case study. The final step in the assembly of a product selling for £100 is to fix a lid on the cast case with eight 4mm self-tapping screws. It is suggested we save 4p by having the screw holes cast in, instead of having them drilled in a separate operation. The data sheet for the screws suggests a tapered core hole, diameter 3.75 + 0.05, -0. Interestingly the H11 tolerance for a drilled hole is +0.075, -0, which is more generous! We put 3.75 +0.05 on the drawing, but let's assume we can get away with +0.075 as for drilling. 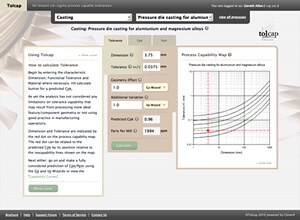 Using the Tolcap software (note we enter the tolerance as the equivalent +/- 0.0375), this is capable tolerance for drilling (cpk = 1.7), but casting is cpk = 0.96 and that's 1994 PPM out of tolerance for each screw (Fig 5). With 10 screws, that means 20,000 PPM or 2%. Assume 10,000 PPM are too big & 10,000 PPM too small. 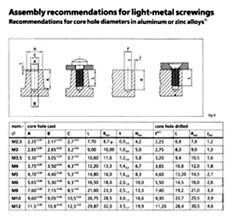 If the holes are too small, and if screws shear in 1/100 assemblies when they are driven in, then since this is the last operation, we lose virtually the whole value of the product. That's a bill of £10,000 per million products or £0.01 per product. If the holes are too big, a screw will work loose and 1/100 products will leak and be returned under warranty. That's another 10p per product, at best, but remember Murphy's Law, and we might get more lose screws than we thought! So we save 4p by not drilling: but the question for the organisation is who pays the 10p quality cost?